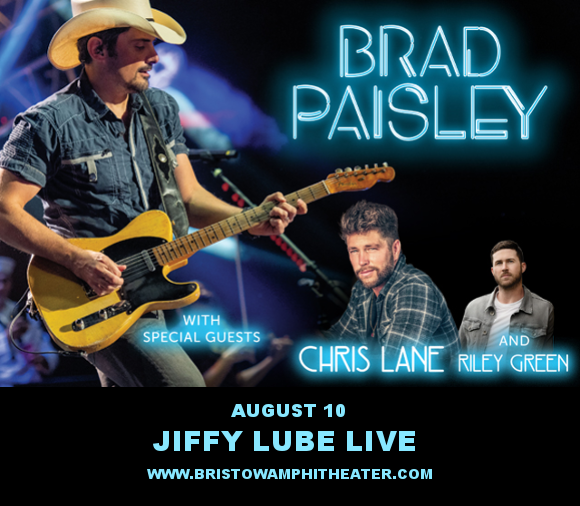 Country lovers, are you hyped for Brad Paisley?? The “Bucked Off,” singer hits the road in 2019 with special support from Chris Lane and Riley Green! The massive world tour will bring him to Bristow’s Jiffy Lube Live on Saturday 10th August 2019 – be there!! Tickets on sale now, but they’re not expected to last for very long – grab ‘em while you can!! Does Brad Paisley really need any introduction?? One of the best-known names in country music, his is a name synonymous with the genre the world over. To date, he has sold over 11 million albums, with an amazing 19 of his singles hitting the No.1 spot on the Billboard Country Airplay chart, setting a new record in 2019 for the highest number of consecutive singles (10) to top the chart. In addition to 14 Academy of Country Music Awards, he has earned the crowning achievement of country music artists; incuction into the Grand Ole Opry. Get ready to hear all the latest songs from Brad Paisley LIVE – have you got your tickets yet? ?